Fountains Abbey is approximately three miles south west of Ripon in North Yorkshire, England near to the village of Aldfield. Founded in 1132, the abbey operated for over 400 years, until 1539, when Henry VIII ordered the Dissolution of the Monasteries. It is one of the largest and best preserved ruined Cistercian monasteries in England. It is a UNESCO world heritage site, a major tourist destination and is run by the National Trust. 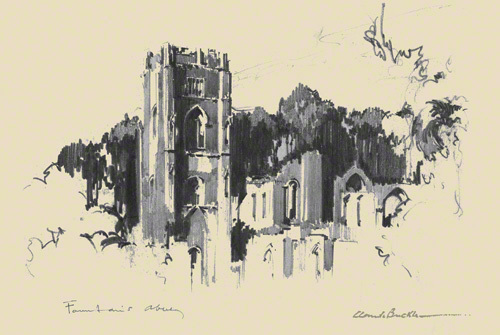 Claude’s Buckle’s pencil sketch shows the main tower looking from the south. The tower called Huby’s tower is 167 feet high and was built in the 1500 by Abbot Marmaduke Huby and is the main feature of the Abbey. The whole site which includes the Studley Royal is well worth a visit. This sketch may have been a proposal for a railway poster. Created in 1956.